This adorable stuffed Turtle is made with the beautiful African Flower Hexagon motif. They are amazingly gorgeous and unique. They truly stand out anywhere in the house. 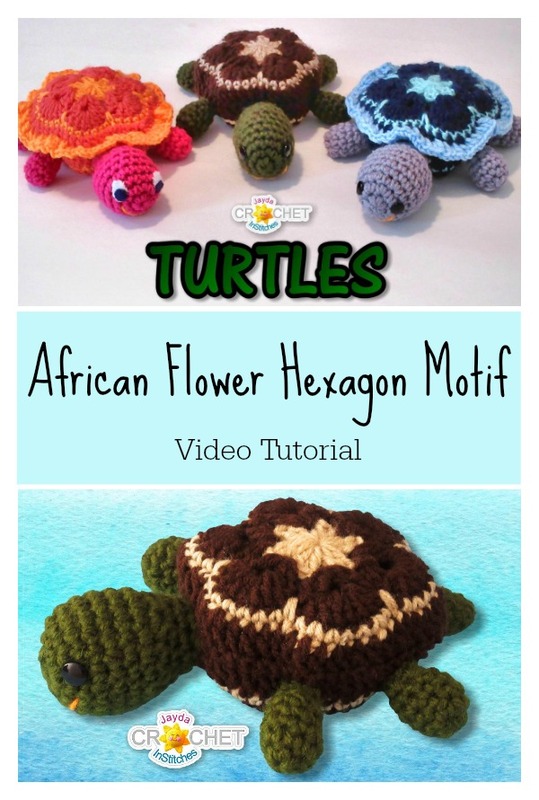 The African Flower Hexagon Motif Turtle Free Crochet Pattern provides step-by-step photos and links to additional video tutorials to make Turtle. You can follow the directions and make it a pincushion, or skip sewing the head and appendages on, using snaps instead. Do the same for the shell and you’ll have a toy kids can take apart and put back together mixing up the body parts for fun. There are so many fabulous color combinations you can choose. What a fantastic way to use up your yarn stash. Thanks inart and Jayda InStitches for sharing this free pattern and video tutorial. The links for the free patterns are provided below photos. Happy crocheting. Happy crocheting. You might also like Amigurumi Turtle Free Crochet Pattern.